Who's going to face Noah in the 2nd round? Were there any real doubts? Rose is not yet MVP and the Bulls still haven’t really won anything worth the history books, but they’ve finally gotten rid of the Indiana Pacers. After two straight postseasons that saw Chicago bow out in the first round, the Windy City is preparing to host the Eastern Conference Semi-Finals. Props shold be given to Frank Vogel and his Pacers though. They were never really out of the series despite falling behind in the win count. 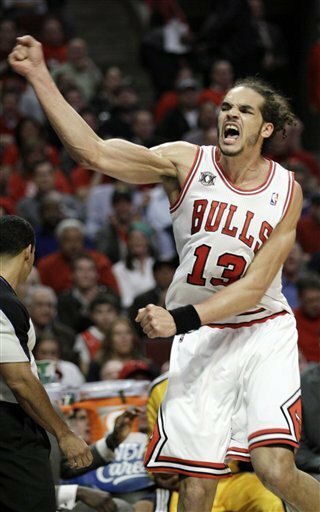 They fought tooth-and-nail with the top-seeded Bulls and managed to slow down Rose in Game 4. He might even feel the pangs of his slight injury when Atlanta/Orlando rolls in. For now, however, Chicago has been able to live up to the hype. Luol Deng making 24 points and Ketih Bogans hitting 5 threes are good signs, but if Tom Thibodeau’s dreaming of playing deep in May, the real Carlos Boozer will have to stand up (he only had 2 points). When Dwight Howard scores only one field goal and finishes with an 8 point, 8 rebound effort, the Magic should lose. But because, for the first time this postseason, his teammates shot the hell out of the Amway Arena, Stan Van Gundy will have to watch game tapes and prep for a Game 6. JJ Redick, Ryan Anderson, Quentin Richardson, and Gilbert Arenas sparked a productive Orlando bench to combine with come-backing Jason Richardson to lead the Magic’s charge. Atlanta didn’t make it too tough for Orlando by shooting just 36%, but it seems like the Hawks remain upbeat about their chances to close out at home. 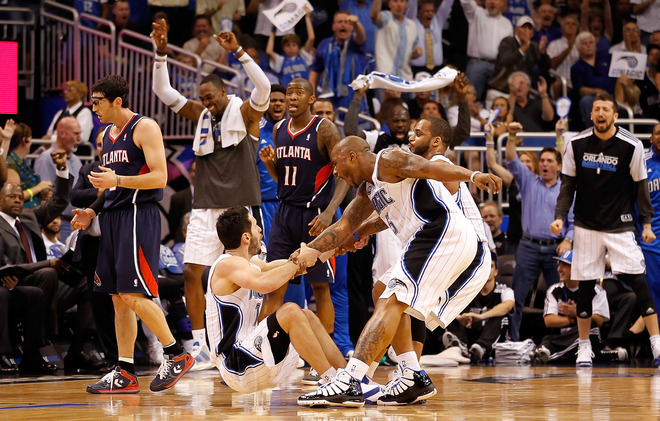 “We’re in a situation where we still feel good about ourselves,” Atlanta coach Larry Drew said. That may be true, but what will they do when Howard inevitably makes up for his mediocre performance along with a throng of Magic wingmen bursting at the seams with confidence? We could be looking at a 7-gamer here. Sprained what? Kobe Bryant dispelled all fears of his twisted ankle severely hampering him by leading the Lakers to a Game 5 win and a 3-2 lead against the New Orleans Hornets. He had loads of help too, especially from twin bigs Andrew Bynum and Pau Gasol, who connected for 34 points. Ron Artest also played sticky D as Chris Paul wasn’t really able to do much after a wonderful first quarter. Now both teams go back to Louisiana and try to slug it out in Game 6. Three guys finished with 20 or more points for the Hornets, but they’ll need to contain Bryant if they’re entertaining even a sliver of hope to extend the series even further. 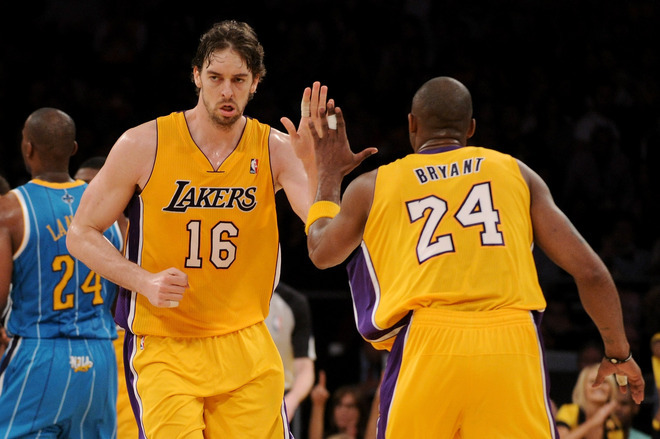 Though nobody expected the Hornets to push the defending champs this far in the first round, I’m sure they’ll continue to push their luck and try to force a rubber match back in the City of Angels.